But compiling on different machines with different versions of the office will result in different results, sometimes it will compile, sometimes not... Things like this can happen, or maybe this. Turns out in each version of excel all sorts of things can be different (not just references though that is the most common issue). Yes this is still a major pain point, right now I have a series of manual testers (people) review all relevant files on various different configurations based on our release schedule, there has got to be a better way to do this. What I would prefer is some sort of PowerShell script/.Net project(C#, VB.NET) that would accomplish this, even if I had to setup a server with a bunch of versions of office, I think it would be well worth the investment. This odyssey just underlines to me how difficult VBA development is. Am I really the first person to have issues between different versions of excel? Is it unreasonable to ask to be able to compile under different versions? MS may love it, but to me it's almost like this language doesn't really have a long term plan past just supporting legacy code. It just continues to exist without any major official future iterations or considerations as it relates to core development challenges such as this one. You need to go to Excel -> File -> Options -> Trust Center-> Trust Center settings and check the option Trust access to the VBA project object model (if you don't check it the below code will raise the run-time error 1004 programmatic access to visual basic project is not trusted). on C something like that, Don't forget to add excel packages to namespace. 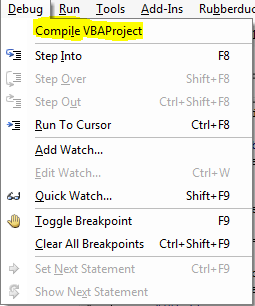 I think you can accomplish using some VBA IDE automation. You can do this process with several languages, however, I chose Autohotkey out of familiarity. I don't think you can use VBA to accomplish this as I don't think you can compile other code while running other VBA code (could totally be wrong here! ), so you need another process to get this working. You'll need to trust the VBA Project object model in Excel. This code works by first creating a new Excel Application object and opening the workbook needed. Next it finds the DebugButton by navigating the CommandBars then calls the Execute method which is what calls the Compile action. This was a massive struggle, turned out the implementation of this is challenging in multiple ways. I really appreciate all the assistance that's been provided though, using the suggestion from @DmitrijHolkin, I used the "Microsoft.Office.Interop.Excel" library as the starting point for this. What I didn't understand before was that you could invoke the "Compile" function from C# and have that run in a separate excel window. Now where that seems simple to accomplish in theory, the implementation of a script/application turned out to be a bit of a challenge. There are all sorts of things you need to worry about. You need the version of Excel installed, that you wish to test. The ability to tolerate windows popping up/being closed (i.e. needs to be run on a unused user account/machine). Not the answer you're looking for? Browse other questions tagged c# vba powershell ms-office or ask your own question. How do I get a return value from Task.WaitAll() in a console app? How to check from .net code whether “Trust access to the VBA project object model” is enabled or not for an Excel application? Automate Onenote 2010 From Excel 2007, using VBA?